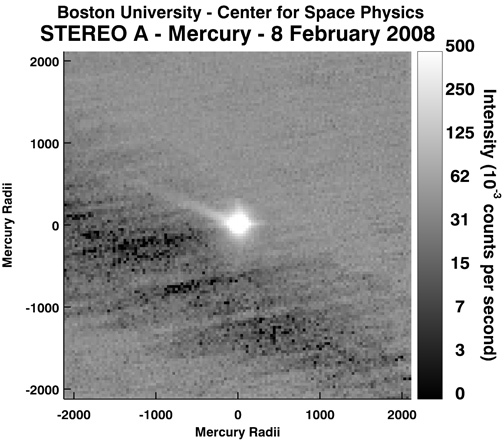 Scientists from Boston University's Center for Space Physics (CSP) reported the presence of a comet-like tail in images of the planet Mercury taken by STEREO, in a presentation given September 22, 2010 at the European Planetary Science Congress (EPSC) meeting in Rome. It's been known for a few years now that a tail can be seen in light from sodium gas sputtered off the surface of Mercury. The Sun's radiation pressure then pushes many of the sodium atoms in the anti-solar direction creating a tail that extends many hundreds of times the physical size of Mercury. The sensitive STEREO white light observations, however, present a new way to study this tail. "What makes the STEREO detections so interesting is that the brightness levels seem to be too strong to be from sodium," commented Schmidt, lead author on the paper presented at EPSC. A joint study is now underway between the Boston University and STEREO teams to use a combination of ground-based and STEREO data to explore the composition of Mercury's tail. Of special interest is the way the tail feature was spotted in the STEREO data. It was not found by the Boston University team, but by Ian Musgrave, a medical researcher in Australia who has a strong interest in astronomy. Viewing the on-line data base of STEREO images and movies, Dr. Musgrave recognized the tail and sent news of it to Boston asking the BU team to compare it with their observations. For more information, please check out the press release at http://sirius.bu.edu/News/.